We’re probably a bit late reporting on this one but as England are playing today it seemed appropriate to mention the Philips Universal Remote – World Cup Party Edition. 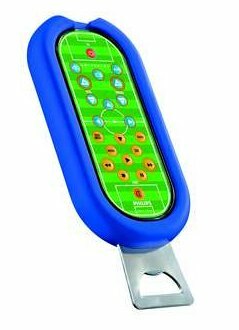 The World Cup remote control is shaped and colored like a football pitch. The buttons are colored and positioned as opposing players but must admit it’s a formation I’ve never seen before. The only reason I’d need this remote when watching a game would by for it’s ingenious other purpose, an inbuilt bottle opener. Sensibly it doesn’t include a counter like that other bottle opener we wrote about. You can get the football remote from Phillips, found via Ideal Gadget.